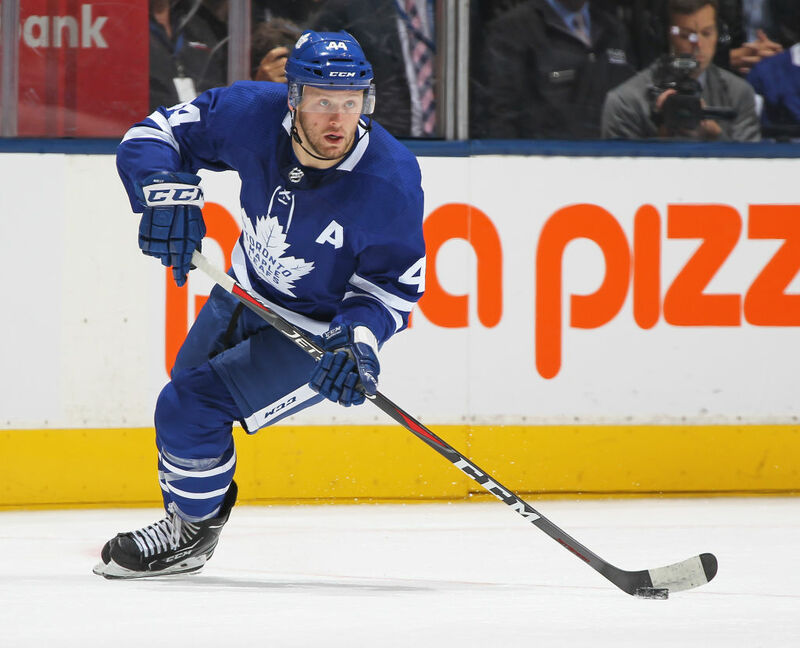 HomeNHLMorgan Rielly – Norris Trophy Winner? For the Toronto Maple Leafs, last night’s 7-5 win over the Florida Panthers was truly a barn-burner that saw 12 different Maple Leafs skaters hit the scoresheet. Among the boat loads of goals and assists, a few different Leafs reached lofty scoring milestones. With his four-goal effort, John Tavares reached 45 goals for the first time in his career. John Tavares is the first Leaf in 25 years to score 42 goals. JT’s linemates got in on the action with Mitch Marner reaching 90 points on the season with his assist on Zach Hyman’s 20th goal on the season. On Hyman’s 20th, the puck could have actually been split for three different trophy mantles considering, with a quick feed down low to the spinning Hyman to pick up an assist, Morgan Rielly picked up his 70th point of the season. With this benchmark point total, Rielly became the first Leafs blueliner since Borje Salming in 1979-80 to eclipse the 70-point mark. In his sixth NHL season, Rielly has been simply incredible in delivering on the sky-high potential Brian Burke promised when he drafted the Vancouver-native fifth overall in 2012. Such a dominant season hasn’t been seen by Leafs defenseman in decades. Which begs the question: has Rielly been good enough to win the Norris Trophy? Rielly’s Norris Trophy bid begins with his ability to score the puck. He currently leads all NHL defensemen with 20 goals and 51 even-strength points. His 70 total points trail only Brent Burns at 79 and Mark Giordano with 72. 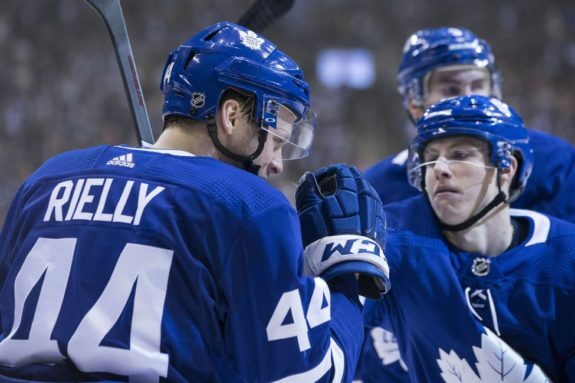 With his team-leading 23 minutes of time on ice, Rielly has proven himself an irreplaceable piece for a Toronto club with real Stanley Cup aspirations. At 45-25-6, the Leafs currently have the fourth-best record in the league. Toronto relies heavily on Rielly, as most nights he and Ron Hainsey draw the unenviable task of lining up against the opponent’s top lines. Even with more minutes against top-end competition, Rielly continues to flourish. The knocks for Rielly’s Norris Trophy campaign are due to his play in his own end. To be fair, there isn’t anything necessarily wrong with his defensive game. But when held up to elite two-way talents like Victor Hedman and Giordano, the difference of play in their own end is palpable. Also, while he may get the most minutes on the Leafs, when compared to the rest of the NHL, Rielly is only 31st among defensemen in time on ice. His 87:20 of penalty kill time pales in comparison to other players considered to be undisputed horses such as Drew Doughty, Roman Josi and John Carlson who each have more than 180 minutes. Even with the elite offensive production from Rielly this season, it feels like he comes up a bit short in the Norris conversation. Burns has once again racked up the gaudy scoring totals that typically lands him the Norris votes. But for my money I believe Giordano should be the odds-on favourite this season. His 72-point season is complimented with a dominant two-way game that has been the backbone of the Calgary Flames’ bounce-back season that sees them currently sitting with the second-best record in the NHL. In terms of offensive production by a Leafs defenseman, Rielly’s 2018-19 season is definitely one of the best of all-time. With six games remaining on the season, his 70 points are tied for sixth-best in franchise scoring by a defenseman. While he might be nine points shy of Ian Turnbull’s record 79 -point 1976-77 season, Hockey-Reference’s era-adjusted point metric would suggest Turnbull’s production would have the equivalent of 70 points in 80 games when compared to the production of toady’s NHL. Rielly is two goals shy of tying Turnbull, Al Iafrate and Red Kelly for the franchise record of 22 goals for defensemen over a season. By all accounts we are witnessing one of the greatest offensive performances in franchise history and Rielly’s numbers aren’t even inflated by outlying power play numbers (ie. Tomas Kaberle scoring 51 of his 67 points on the man advantage in 2005-06). At this point in time, no Maple Leaf has ever won the Norris Trophy as the NHL’s best defenseman. While it may be unlikely that Rielly bucks the trend this season, it should not dissuade Leafs fans for admiring one of the best regular seasons by a Toronto defenseman ever.